Newly elected Hamilton County Sheriff Dennis Quakenbush was sworn-in on Thursday, December 20 and is in the process of administering the oath of office to deputies and officers at the agency. Quakenbush recently announced changes in administration personnel for his tenure in office. 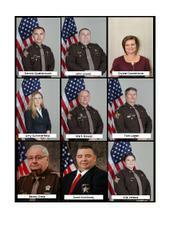 Indiana law allows the sheriff complete hiring authority over the position of chief deputy as well as naming the jail matron and legal advisor. 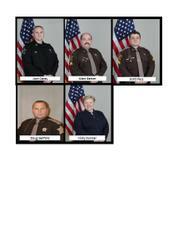 The sheriff also is permitted to name administrative positions and set job responsibilities for each member of the agency. Joining the Sheriff’s Office as Chief Deputy is John Lowes. A newcomer to the agency, Lowes has 20 years in law enforcement, most recently with the Westfield Police Department where he served as Investigations Captain and Patrol Captain among other positions. Lowes holds a B.S. in Management from Indiana Wesleyan University. Another newcomer to the Sheriff’s Office is Jail Matron Crystal Condellone. Prior to her appointment as matron Condellone owned a small business and spent much of her career working in various administrative and customer service positions. She has been training for several months as she takes over varied administrative responsibilities in the office. Amy Summerfield is a familiar face in Hamilton County government but leaves the Prosecutor’s Office to join the Sheriff’s Office as Legal Advisor. Over the past eight (8) years in the Prosecutor’s Office, Summerfield has overseen misdemeanor and felony court cases as well as the initial screening of charges for those arrested in the county. Summerfield has also worked on various committees and programs such as the Pretrial Release Program, the Vivitrol Program, and the Council on Alcohol and Other Drugs. Former Sheriff Mark Bowen has been selected as Captain of Administration. Having served more than 27 years with the Sheriff’s Office, including eight (8) years as Chief Deputy and eight (8) years as the elected Sheriff, Bowen will continue to contribute the agency in a new position focusing on administrative and support functions. Tom Logan has been appointed over the Patrol Division. Logan has been with the Sheriff’s Office for 27 years serving most recently as lieutenant of Nights A squad. He has also contributed to the agency through the DARE program, the Honor Guard, and the Emergency Response Team. Captain Benny Craig will transfer positions and take responsibility for the security of the Government and Judicial Center as well as the Civil Division. Having served more than 46 years with the Sheriff’s Office, Craig is no stranger to those around the county. Remaining in charge of the Investigations Division is Captain Scott McKinney. A lifelong resident of Hamilton County, McKinney has served with the Sheriff’s Office for 28 years, much of that time as a detective. Also remaining in position is Captain Kija Ireland who will oversee the Juvenile Service Center. Ireland was hired as a Merit Deputy is 2001, became a detective in 2004, and was promoted to head the Juvenile Center in 2017. Josh Carey will head the Jail Division. Carey was hired as a Correction Officer in 1995 and has worked in a variety of positions within the division, most recently as Assistant Jail Commander. Carey will be joined by Sean Bauer who will assume the role of Assistant Jail Commander. Rounding out those selected to assist in running the agency are Sgt. Mark Barker who will oversee Special Events and the Reserve Division, Sgt. Scott Pass who will act as Training Coordinator, Doug Sanford leading Humane Law Enforcement/Animal Control, and Vicky Dunbar who works in accreditation. Shift and squad lieutenants and sergeants in each division remain in place as these positions are earned hard ranks through a promotion process rather than political appointments.